Of course, I use supermarkets like everyone else, like this one up the road at Green Lanes in north London, but a minor war has waged closer to home where there a planning application has been made to build one in a street of small, quirky independent shops that give our locality its distinct flavour. The campaign has already won concessions - there will now be no customer car park, for instance - but the planned store would still be out of scale and out of place. 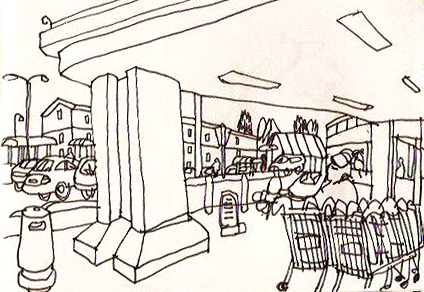 The big supermarkets seem to get whatever they want, and we the people shouldn't be steamrollered. But I can't help thinking that perhaps I'm just turning into a middle-aged, grumpy, Nimby. 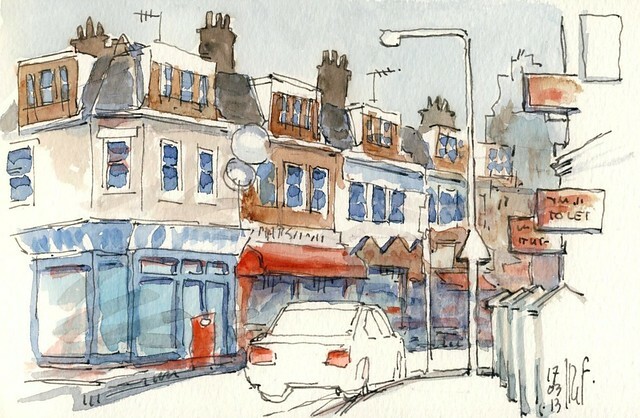 Albion road in Stoke Newington (London suburbs). I was waiting there in the very early morning for the night bus N73, to start the trip home to the Netherlands. In my eyes it's a typical London suburban street, with rows of small colourful shops mostly run by Pakistan, Turkish or Chinese shopkeepers. London must be one of the most multicultural cities I've ever visited. One funny note: shortly before I started this drawing I saw a fox sneaking through the front lawns of Clissold crescent (the road towards the left), I suppose moving towards Clissold park. Not something you would expect in the middle of London. I made a short visit to London, to visit my daughter, the Sir John Soane museum and the Egyptian part of British museum. I flew to London yesterday morning as early as 7 a.m., and returned home in Maastricht this morning at 9.30 a.m. 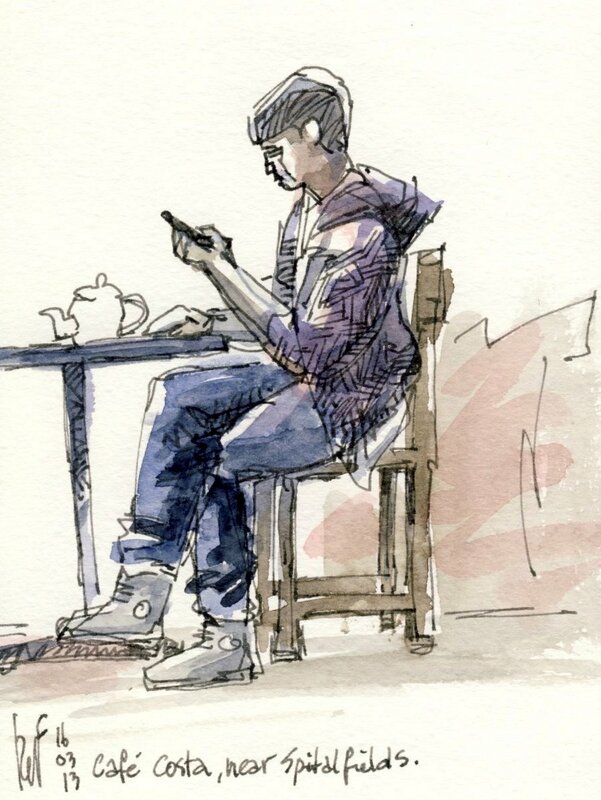 Above a sketch I made of a guy toying with his Iphone in café Costa, near Spitalfields. 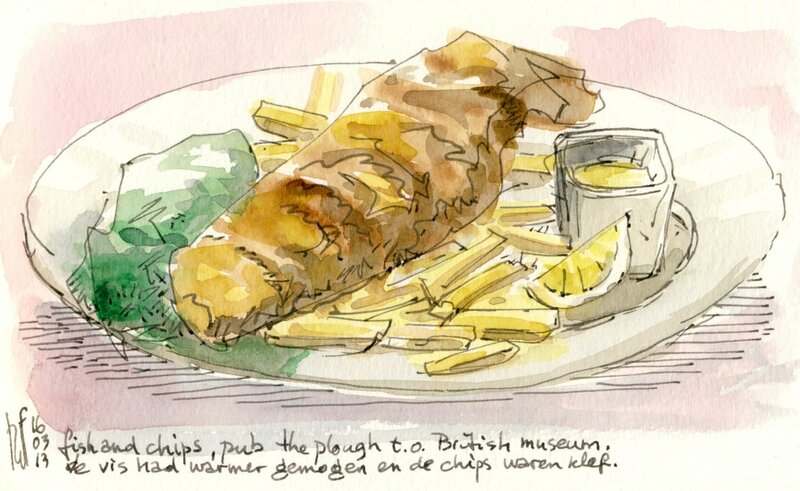 And an impression of another highlight of British cuisine: the fish and chips lunch that we took at a local pub near the British museum. The F&C were not that good, not warm enough and quite expensive. And the mashed peas (which seem to accompany every British meal) were plain cold. But it filled our stomachs very well. Now that's Englands finest. 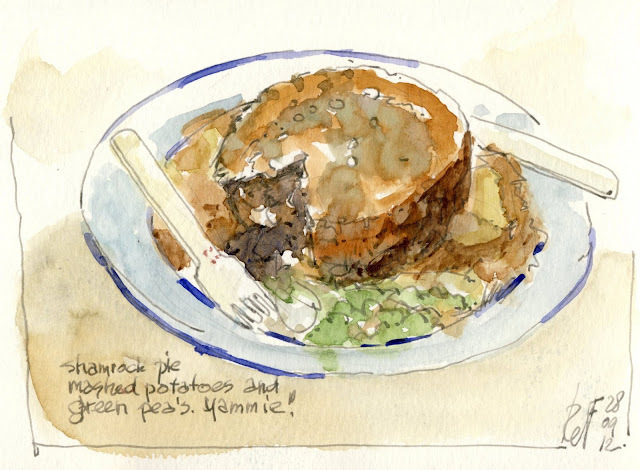 Forget about Jamie Oliver. I always wonder how they get these peas in this radioactive shade of green.